NEW ORLEANS – Conference Championship Weekend came and went in NAIA Indoor Track & Field and it shook up the most recent National Rating Index that was released on Wednesday by the U.S. Track & Field and Cross Country Coaches Association (USTFCCCA). Six of the top-10 men’s teams and five of the top-10 women’s teams shifted spots in the National Rating Index between Week 4 and Week 5 as the national championship meet looms in the distance. Remember: The 2019 NAIA Indoor Track & Field Championships will be held February 28 to March 2 in Brookings, South Dakota. 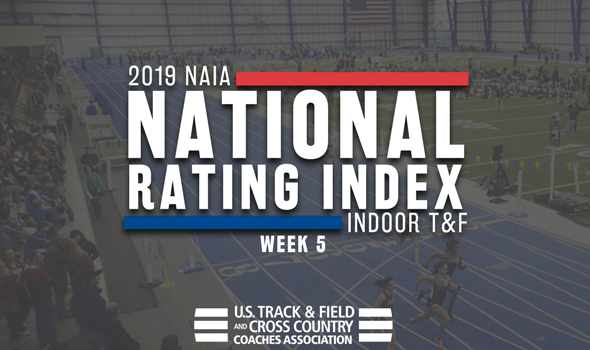 The top-3 teams in the Men’s National Rating Index remained exactly the same as they were last week: Indiana Tech continues to hold down the No. 1 spot, followed by No. 2 Wayland Baptist (Texas) and No. 3 Concordia (Neb.). Bethel (Ind.) made some moves in the National Rating Index from Week 4 to Week 5. The Pilots navigated from No. 7 to No. 4 thanks to impressive outings from Jordan Downs and Thomas Jackson. Downs recorded national top marks in both the long jump and the pole vault, while Jackson is now ranked third in the long jump. Doane (Neb.) is back in the top-5 after a short break. The Tigers received a strong effort from their 4×400 team this past weekend (now ranked fifth nationally) to go along with Levi Sudbeck’s sixth-best billing in the pole vault. The biggest movers in the Men’s National Rating Index this week were Ottawa (Ariz.) (up 57 spots), Trinity Christian (Ill.) (up 36 spots) and Lindenwood-Belleville (Ill.) (up 24 spots). Nothing changed in the top-4 teams of the Women’s National Rating Index. Indiana Tech is still the clubhouse leader, while No. 2 Wayland Baptist (Texas) and No.3 Concordia (Neb.) are at least within shouting distance. Fourth-ranked Doane (Neb.) has a little bit of catching up to do to match the pace set by the top-3 teams. Southern-New Orleans (La.) gained some ground between Week 4 and Week 5. The Knights are now ranked fifth, just a few points shy of fourth place. SUNO watched Kimone Hinds, Xuxa Peart and Kimona Smikle notch national top-3 marks this past weekend in the 400, 200 and 400, respectively. The biggest movers in the Women’s National Rating Index this week were Tennessee Wesleyan (up 19 spots), Ottawa (Kan.) (up 19 spots) and Briar Cliff (Iowa) (up 17 spots).